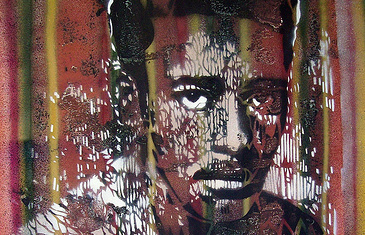 The picture above is a stenciled portrait of Alemayehu Eshete, a renowned Ethiopian vocalist, being displayed at an exhibition in Addis at Alliance Ethio-Francaise’s gallery starting from Friday, May 15 as a part of the 8th Ethiopian Music Festival. The work by French painter, Pierr Dumond, (known by his artistic name Artiste-Ouvrier) is based on a photograph from Abyssinia Swing, showing Alemayehu in his youth as a nineteen-year old obscure singer. 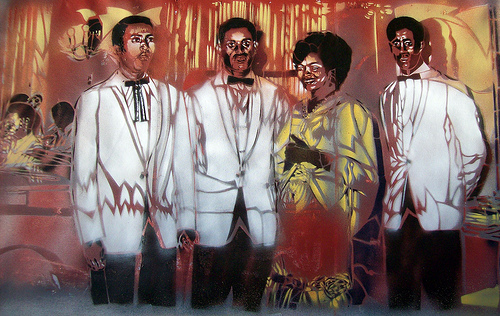 The acrylics works are highly detailed stencils and silk screened on canvass. Artist-Ouvrier’s technical skill in combining emphatic brushstrokes with photographic imagery has captivated viewers. The artist has also displayed other portraits of Ethiopian musicians such as Tilahun Gessesse and a group portrait of Tilahun Gessesse, Mahamoud Ahmed, Bizunesh Bekele. March 1, 2009 in preparation for the Music Festival. The Festival which opened on Friday this year has chosen to honour two composers and arrangers, Sahle Degago and Lemma Demissew, two prevalent figures of “Swinging Addis “,”unfairly erased from collective memory”, according organizers. Sahle Degago has spent his whole musical career among the Imperial Bodyguard Orchestra. An inspired melodist, a delicate songwriter and above all an arranger as sophisticated as prolific, he was the main architect of the successes of other members of the Orchestra such as Tilahoun Gessesse, Bezunesh Bekele or Mahmoud Ahmed, according to the promotional brochures. The career of Lemma Demissew bloomed in the shade of the Army Band. Contrary to Sahle Degago, who was strongly Ethiopian in his approach, Lemma Demissew was often a feverish modernist, deeply inspired by the electric wave born on the other side of the Atlantic Ocean. A pianist, a composer, a singer, he will also remain, for our music lovers’ soft little hearts, the beloved arranger of many of Mahmoud Ahmed’s or Alemayehu Eshete’s anthological vinyl records. Publisher’s note: This piece is re-posted from the Visual Poets Society’s blog with permission. Magnificient! Alemayehu Eshete, Tilahun Gessesse, Mahamoud Ahmed, Bizunesh Bekele are national treasures. When is the Ethiopian music festival? I only recognized Tilahun and Bezunesh on the last pic. Great work!